Aberdeen Flowers deliver a range of gifts perfect to congratulate someone on any occasion. There is an endless array of beautiful flower arrangements which our florists in Aberdeen will arrange to order. Our plants are beautiful and can be delivered in Aberdeen and the North East of Scotland. Aberdeen Flowers also have Wines and maybe more appropriate for celebrations we have a variety of Champagnes. You can order our wine and champagne through our website and our Aberdeen Florists can deliver your gift with flowers or by themselves. We also have a variety of Chocolates in various sizes which are a perfect accompaniment for your Aberdeen Flowers. Aberdeen Florists have a variety of other gifts which you can send with flowers or by themselves. We have teddy bears, balloons and beautiful vases. Our florists in Aberdeen can deliver your flowers and gifts the Same Day if you order before 3pm to give us enough time to prepare and deliver everything you want to celebrate any occasion or achievement. With our networks of florists throughout the UK we can get your flowers delivered most places in the UK the Same Day as well. Our flower arrangements include beautiful bouquets of all colours and styles so that there will be something great for your recipient available here no matter whom you want to gift. On the other hand if you would rather choose for yourself exactly how you would like your flowers arranged, you can contact our Aberdeen Florists to let them know your preferences so that they can create a beautiful bespoke Aberdeen Flowers arrangement that will be unique to you and your recipient. Our Aberdeen Florists are always pleased to help you choose flowers and colours for your arrangement so that you make sure to pick something suitable for every occasion. All of the flowers we use at Aberdeen Flowers are cultivated in Holland and imported directly to us because we know that this is the best way to ensure that every arrangement made by our Aberdeen Florists is as fresh as can be and of the best possible quality. We want your Aberdeen Flowers arrangements to have a long life and be beautiful for as long as possible so that you get more time to enjoy them. Our Aberdeen Florists are all highly skilled and take every measure to ensure that your flowers reach you in great condition. 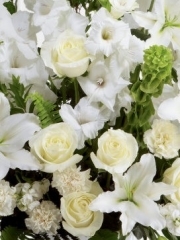 Our Aberdeen Flowers drivers are always exceptionally careful when delivering your arrangements and bouquets so that you don’t need to worry about any kind of mishap when it comes to your gifts and flowers from our Aberdeen Florists. We will deliver anything you order on your behalf so that you can relax in the knowledge that your Aberdeen Flowers are in safe hands. At Aberdeen Flowers we pride ourselves on our customer service which we always aim to make our top priority. We want you to know that you can trust our Aberdeen Florists to take as much care as is necessary at every step along the way, from when you place your order to the moment of its safe delivery to your recipient. That way you can let us do everything necessary to aid you in celebrating your recipient’s achievements! Aberdeen Florists love being a part of your congratulatory messages because creating beautiful flowers for people is what we do best and everyone at Aberdeen Flowers is passionate about providing a great service. Customer satisfaction is always a top priority for all of our Aberdeen Florists, so if you have any queries about our service please contact Aberdeen Flowers online, in our shop or over the phone and someone will be pleased to help you.